Acids are produced during Enhanced Reductive Dechlorination (ERD) which can cause pH to drop, inhibiting treatment. Alkaline materials including hydroxides and carbonates are sometimes added to the aquifer during ERD to maintain a pH of greater than 6, improving bioremediation performance. This article describes a simplified approach and a spreadsheet-based design tool for estimating the total amount of base required to achieve a specified target pH at the end of the treatment period, once all reactions have gone to completion. To prevent overshoot and excessively high pH, users typically add a fraction of the total base required in several increments spread over time. CONTRIBUTOR(S): Dr. Robert Borden, P.E. Aquifer pH lower than 6 can reduce the efficiency of enhanced reductive dechlorination (ERD) and other in situ remediation processes. This article describes a simplified approach using a spreadsheet-based design tool for estimating the total amount of base required to achieve a specified target pH at the end of the treatment period, once all reactions have gone to completion. This approach requires simplification of several important processes controlling subsurface pH, and is only appropriate for developing initial estimates of the total amount of base required. In practice, aquifer pH should be monitored during ERD and periodically adjusted to maintain conditions for optimal microbial growth and contaminant degradation. Early in the bioremediation process, reactions will not have gone to completion and less base will be required to maintain the target pH. To prevent overshoot and excessively high pH, users typically add a fraction of the total base required in several increments spread over time. In humid areas, rainfall combined with carbonic acid produced in the soil leaches out base cations (Na+, K+, Ca2+, Mg2+) gradually acidifying the soil. Figure 1 shows soil pH in the contiguous United States. Figure 1. 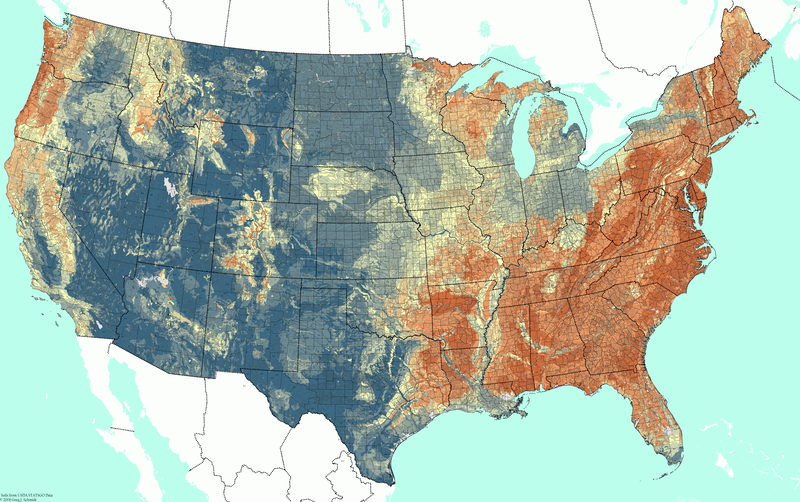 Soil pH in the contiguous US (Soil pH). Alkaline soils (pH>7.4) are shown in blue. Acidic soils (pH<6.1) are shown in brown. Groundwater pH is influenced by soil pH, but also by other factors. As acidic water infiltrates through the soil profile, some of the acidity may be neutralized by dissolution of soil and aquifer minerals. Silicate minerals including feldspars and micas can hydrolyze over time, consuming acid, and releasing dissolved cations (Na+, K+, Ca2+, Mg2+). However, these weathering reactions are slow, and are often not sufficient to prevent pH declines during ERD. Figure 2 shows a cumulative frequency distribution of groundwater pH at a site in eastern North Carolina. Average soil pH at this site is approximately 5. The vadose zone and surficial aquifer at the site are predominantly quartz sand and weathered clays, so weathering processes provide minimal buffering capacity. 90% of the groundwater pH measurements were between 4.5 and 6.0 indicating low soil pH at this site was a reasonable predictor of acidic groundwater. At other sites containing carbonate minerals or relatively young rocks, mineral dissolution often results in greater buffering. Figure 2. 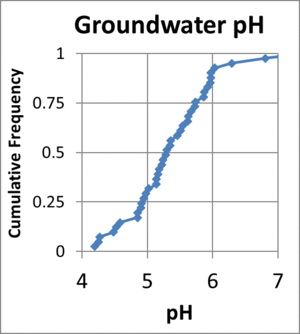 Cumulative frequency distribution of groundwater pH measurements at site in eastern North Carolina where soil pH is approximately 5. Acidity is the amount of base required to neutralize acids present in a water sample. Since various acids can disassociate to different extents, two solutions with the same pH can have different acidities (see pH Buffering in Aquifers). In most cases, the acidity of the background groundwater is the sum of acidity from strong mineral acids (phosphoric, nitric, sulfuric, and hydrochloric acids), organic acids, and dissolved carbon dioxide. Mineral acidity (also referred to as methyl orange acidity) is determined by titrating a sample with a strong base to pH=3.7 (Standard Method 2310, AWPA 2016). If the initial pH is greater than 3.7, mineral acidity is zero. The spreadsheet-based design tool presented here uses this measurement to account for the base demand of any strong acids already present in the aquifer. Total acidity (commonly referred to as phenolphthalein acidity) should not be used to calculate the amount of base required because the titration endpoint of this parameter is pH 8.3, which will over-estimate the base requirement for optimal ERD. Under low pH conditions, organic volatile fatty acids (acetic, propionic, etc.) can accumulate and contribute to acidity. However, in background groundwater, organic acid concentrations are generally low. In the design tool, acidity from background organic acids is assumed to be negligible. In theory, acidity from dissolved carbon dioxide can be measured using a modification of Standard Method 2310 in which the sample is titrated to a target pH using a strong base. When using this approach, special precautions should be taken to prevent any pH shift due to degassing of dissolved carbon dioxide from the sample during transport to the laboratory or during analysis of the sample. In the design tool, acidity from background dissolved carbon dioxide is instead calculated from the dissolved inorganic carbon concentration (DIC) and background pH. This eliminates the problem of pH shift due to dissolved carbon dioxide degassing. Commercial laboratories can measure DIC using a modification of the Total Organic Carbon (TOC) procedure. An aquifer’s buffering capacity is the resistance to pH change and is primarily due to two processes: (1) buffering by dissolved and solid carbonates; and (2) surface complexation and/or ion exchange reactions on mineral surfaces. While mineral weathering processes do influence long-term pH changes, weathering reactions are often too slow to prevent pH declines due to HCl and CO2 production during ERD. Figure 3. 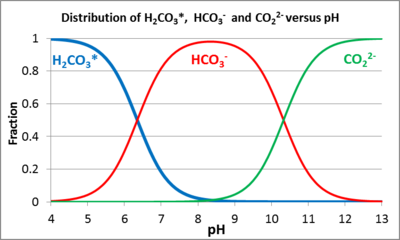 Distribution of H2CO3*, HCO3- and CO32- as a function of pH. For a system open to a large reservoir of carbon dioxide (e.g. the atmosphere), the buffering capacity (assuming no soluble minerals are present) is a function of the partial pressure of carbon dioxide in the reservoir. Near the water table, groundwater is open to the atmosphere and can release excess dissolved CO2 gas if its partial pressure is greater than the reservoir’s, essentially stripping some acid out of the groundwater by partially reversing the above reactions. Figure 4. Buffering capacity of aquifer solids from SA-17 and OU-2 measured in DI water. The legend shows depth below ground surface in feet for individual samples. Surface Complexation and Ion Exchange Reactions H+ sorption to Fe and Al oxyhydroxides and clay minerals through surface complexation and ion exchange reactions can have a major impact on pH. H+ adsorbs strongly to some mineral surfaces, which can accumulate large amounts of H+ as the solution pH declines and release the H+ back to solution as the pH rises. This strong buffer can reduce the pH decline in many systems, but can also greatly increase the amount of base required to increase aquifer pH. Figure 5. Aquifer buffering capacity (pHBC) from multiple ERD sites. When carbonate minerals are present, geochemical models are needed to determine the amount of buffering provided by carbonate mineral dissolution. However, in many naturally low pH aquifers, carbonate minerals are absent and the extent of buffering can be estimated by adding a strong base to the aquifer solids, equilibrating for several days, and measuring the resulting pH. These buffering curves are typically linear in the pH range of 4.5 to 6.5 recommend carrying out the titrations in a uniform ionic strength solution, most commonly 0.01 M CaCl2. 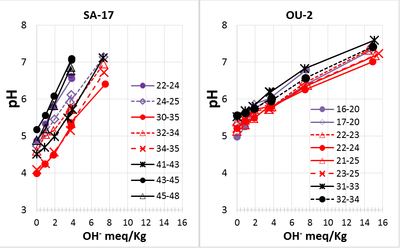 Figure 4 shows the measured final pH versus meq of OH- added per kg of dry aquifer material. Incremental base addition results in a nearly linear increase in pH. The slopes of these curves were estimated by linear regression. pH buffer capacity (pHBC) is calculated as the inverse of the slope and is reported in units of milliequivalents per kilogram (meq/kg) per pH unit. Figure 5 shows cumulative frequency distributions for pHBC in 6 different contaminated aquifers in the eastern U.S. Within a single unit, pHBC values are reasonably constant, with the middle 50% of measurements varying by a factor of two. However, median pHBC values can vary by a factor of ten between sites and even between sandy versus clayey units on the same site. Multiple processes can produce or consume acidity during ERD including redox, precipitation, and hydrolysis reactions. Table 1 shows the amount of H+ released from some important redox reactions. During reductive dechlorination of PCE (C2Cl4) to TCE (C2HCl3), a chlorine atom (Cl) is replaced with hydrogen (H2) releasing one proton (H+) and one chloride (Cl-). As TCE is further dechlorinated to cDCE, VC and ethene, an additional proton is released for each chlorine removed. As a result, ERD can release large amounts of acid. For example, complete reduction of one kilogram of PCE to ethene produces 0.9 kilograms of HCl. Figure 6. Fraction of H2CO3* not ionized (α) versus pH. As shown in Figure 3, CO32- is only present in significant concentrations at pH > 8. For pH ranges relevant for ERD (5>pH>8), H+ release from H2CO3* can be represented by the following reaction. where α is the fraction of H2CO3* that does NOT ionize at the target pH with α = (1+ 10-6.352 / [H+])-1. 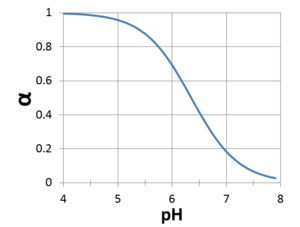 Figure 6 shows the variation in α as a function of pH. At pH 6, α = 0.69, so 0.31 moles of H+ are released for every mole of CO2 produced. However at pH 7, α = 0.18, so 0.82 moles of H+ are released for every mole of CO2 produced. Reduction of some electron acceptors produces OH-, counter-acting acid produced from dechlorination and CO2 production. Representative reactions for reduction of nitrate (NO3-), iron oxides, sulfate (SO42-) and bicarbonate (HCO3-) are included in Table 1. Goethite [FeO(OH)] is used as a typical iron oxide for these calculations. A variety of different bases have been used to raise the aquifer pH to stimulate ERD including soluble and solid carbonates, soluble and solid hydroxides, phosphates and silicate minerals. The carbonates and hydroxides are used most commonly because of their relatively low cost and easy availability. Table 2 summarizes the physical properties of common basic salts used to raise pH. NaOH and KOH provide a large number of OH- equivalents (eq) per kg and are very soluble so only small volumes of base are required to raise the aquifer pH. However, concentrated solutions of NaOH and KOH have pH > 14 which is inhibitory to bacteria, would expose workers to safety hazards, and can partially dissolve aluminosilicates. As described above, solid calcium carbonate (CaCO3) is generally not effective in raising pH during ERD because of its low aqueous solubility. Na2CO3 and NaHCO3 are much more soluble and can be effective in raising aquifer pH. The amount of H+ consumed per mole varies as a function of pH between pH 5 and 8. For closed conditions (below water table where CO2 cannot degas) and pH < 8, NaHCO3 and Na2CO3 disassociate to H2CO3* and HCO3-, consuming H+ by the following reactions. At pH = 6, α = 0.69 so 0.69 moles of H+ are consumed per mole of NaHCO3 and 1.69 moles of H+ consumed per mole of Na2CO3 (Figure 6). However at pH = 7, α = 0.18 so only 0.18 moles of H+ are consumed per mole of NaHCO3 and 1.18 moles of H+ consumed per mole of Na2CO3. As a result, bicarbonates and carbonates are relatively effective at raising the pH to 6. However, these materials provide less alkalinity per unit mass at pH =7, increasing the amount of material required. Ca(OH)2 and Mg(OH)2 provide large amounts of OH- per kg. However, these materials have a low aqueous solubility, making them more difficult to distribute in the subsurface. describe the use of a colloidal form of Mg(OH)2 with improved transport properties. An MS Excel based design tool was developed to aid in estimating the amount of base required to achieve a specified target pH at the end of the treatment period, once all reactions have gone to completion. The general approach and calculations were presented in the previous sections. The design tool is specifically focused on pH adjustment for ERD and calculation procedures include the following assumptions. The target pH is between 5 and 8. The carbonate system is the primary aqueous pH buffer. Organic acids including volatile fatty acids (acetic, propionic, etc.) are consumed and do not accumulate. Any H2 or acetate produced by substrate fermentation that is not consumed through reduction of chlorinated solvents and background electron acceptors (O2, NO3, iron oxides, and SO4) is consumed by methanogenesis. All processes and reactions have gone to completion. The calculated total base requirement is for the end of the treatment period once all acids (HCl and H2CO3) have been produced. In general, the most important factors controlling base requirement are: a) initial and target pH; b) amount of substrate consumed; c) aquifer buffering capacity (pHBC); and d) amount of iron oxides reduced. To calculate base requirement, design tool users must enter the following information. Treatment zone dimensions and design period for this phase of remediation. Site characteristics including average hydraulic conductivity (K), porosity, hydraulic gradient, contaminant concentrations in aquifer material and groundwater, and amount of electron acceptors to be produced (i.e. CH4) or consumed (O2, NO3, Fe, SO4). Background pH, total inorganic carbon, mineral acidity, and pH buffering capacity (pHBC). A database of pHBC measurements is provided to aid users in selecting design values when laboratory measurements are not available. Mass of organic substrate and base to be injected. When vegetable oil is used as a substrate, the fraction of injected oil that is consumed during the design period. Users are reminded that the design tool calculates the total amount of base required once all reactions go to completion. Early in the bioremediation process, reactions will not have gone to completion and less base will be required to maintain the target pH. To prevent overshoot and excessively high pH, users typically add a fraction of the total base required in several increments spread over time. Figure 7. 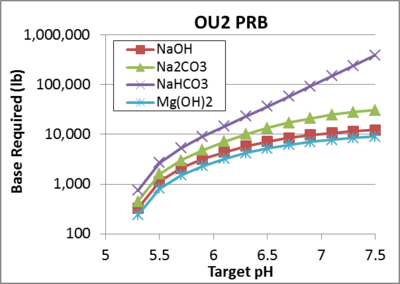 Required base addition for PRB for different target pH values. The design tool was used to estimate the amount of base required to stimulate ERD in a 435 ft long emulsified vegetable oil (EVO) biobarrier at Operable Unit 2 (OU2) on the former Naval Training Center (NTC) in Orlando, FL. The biobarrier consists of two rows of injection wells spaced approximately 30 ft on center which were treated with a total of 20,224 lb of vegetable oil. The vertical treatment thickness was 10 ft, influent groundwater pH ~5, and pHBC = 8 meq/kg/pH. To provide guidance on amounts of base required, the design tool was used to estimate the amount of NaOH, Na2CO3, NaHCO3, or Mg(OH) 2 required to achieve different pH values at the end of the five year treatment period. Results presented in Figure 7 indicate that the amount of base required is very sensitive to the target pH. For target pH values < 5.4, little or no base is required. Increasing the target pH to 6 or 7, requires progressively greater amounts of base because of the soil acidity and carbonic acid released from substrate fermentation. To achieve a pH of approximately 7, 10,200 lb of NaOH or 7,400 lb of Mg(OH)2 are required, which is equivalent to 50% or 37% respectively (by weight) of the vegetable oil injected. Multiple NaOH injections would be required since a single injection would result in an excessively high initial pH and the base would migrate out of the treatment zone over time with flowing groundwater. The total mass of Mg(OH)2 required is less than NaOH, since two moles of OH- are released per mole of Mg(OH)2. However, Mg(OH)2 has a very low aqueous solubility, so the material must be injected in a colloidal form. Since the material is a solid and would not migrate downgradient, 100% of the required Mg(OH)2 could be injected simultaneously with the EVO. The pH of a pure slurry of Mg(OH)2 is relatively high (~10.3). However once injected, CO32- precipitates on the surface of the Mg(OH)2 particles forming a MgCO3 coating that maintains the aquifer pH between 7 and 8. In general, it is not practical to raise the pH to near 7 with NaHCO3 due to the small amount of H+ consumed by this material at near neutral pH. Na2CO3 could be effective, but would require multiple injections due to the high pH (~11.7) and downgradient migration with groundwater flow. Alkaline materials are commonly added during ERD to maintain an aquifer pH of greater than 6. A simplified approach and spreadsheet-based design tool are presented for estimating the total amount of base required to achieve a specified target pH at the end of the treatment period, once all reactions have gone to completion. To prevent overshoot and excessively high pH, users typically add a fraction of the total base required in several increments spread over time. Users should be aware that results are very sensitive to variations in the target pH since the amount of H+ released from carbon dioxide and consumed by NaHCO3 and Na2CO3 is a function of pH. ^ Langmuir, D., 1997, Aqueous Environmental Geochemistry. Prentice-Hall, Inc. Upper Saddle River, NJ ISBN: 978-0023674129. ^ Drever, J.I., The Geochemistry of Natural Waters: Surface and Groundwater Environments. Prentice-Hall, Inc., ISBN 0132727900. ^ Borden, R.C., Lai, Y.S., Overmeyer, J., Yuncu, B. and Allen, J.P., 2016. In situ pH adjustment with colloidal Mg(OH)2. Environmental Engineer and Scientist: Applied Research and Practice, accepted for publication, Vol 17, pp.28-33. This page was last edited on 17 December 2018, at 22:27.